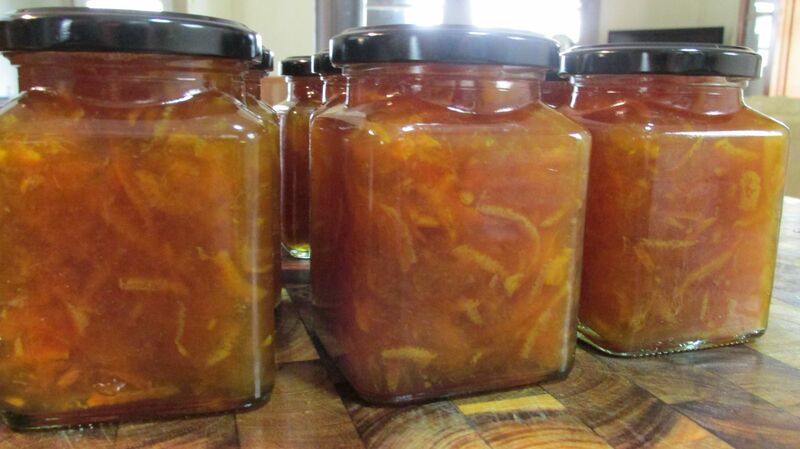 Guest blogger, Vicki Stebbins, shares her easy mandarin marmalade below. 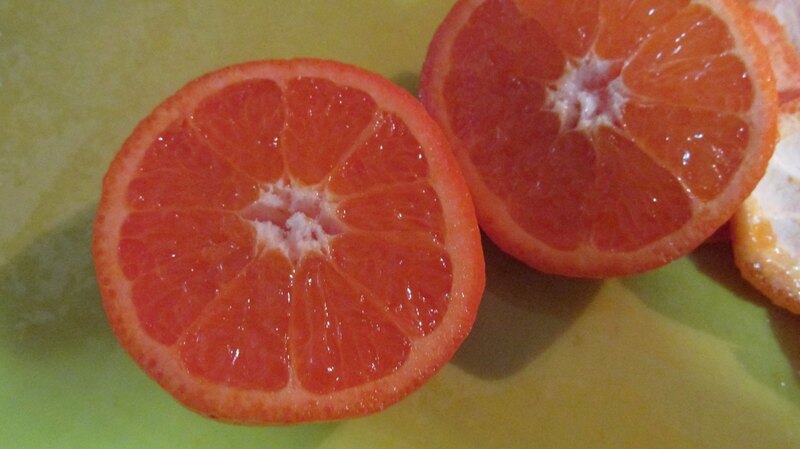 2kg Mandarins – I used Afourer mandarins (were from Aldi on special at the time). I love the Afourer as they are very dark in colour, and have no seeds. So I top and tail and then half them to load into the processor standing up so you get slices not rings. 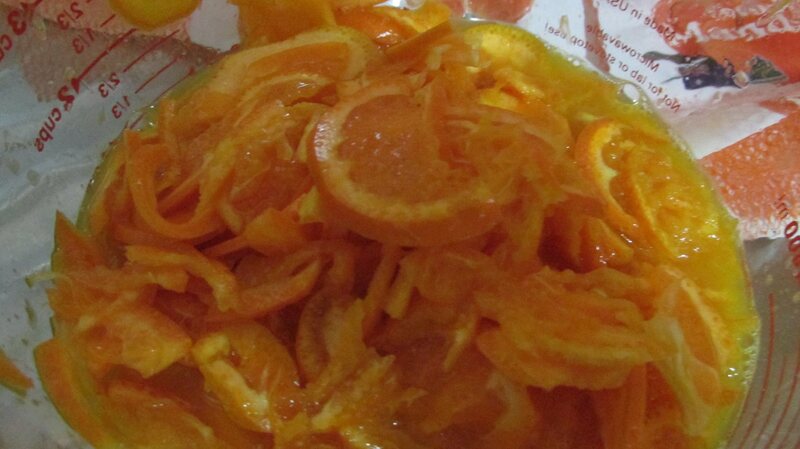 I’m lazy I find it so easy to slice up the mandarins (I do the same with navel oranges) with the food processor. Then I measure out how many cups, I use a 4 cup Pyrex jug, it’s not exact but I fill it up. From the two kg I got 9 cups of pulp. Then I add a lemon. As the lemon had seeds and I never seem to get them all I juiced the lemon and then finely sliced the skin and tossed it in. 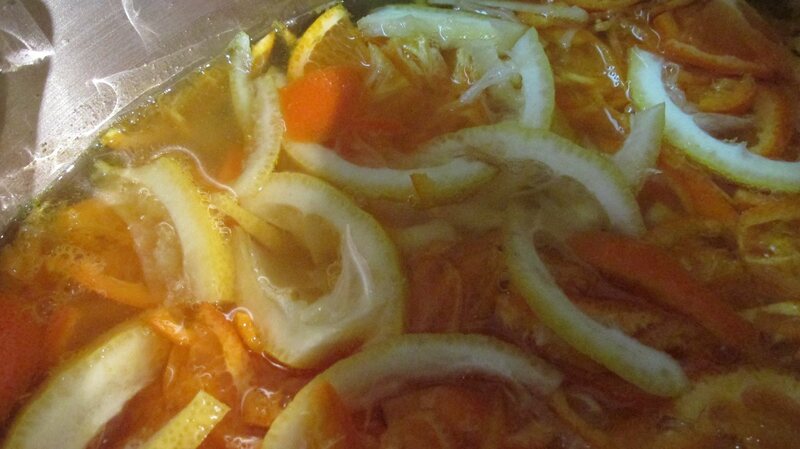 I put it into a stock pot, deep enough that I’ll be able to stir it tomorrow and not spill out the marmalade. 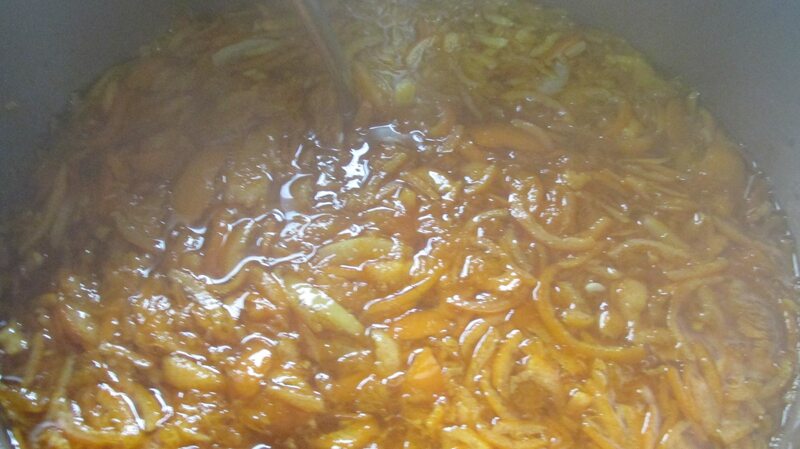 When it’s in the stock pot I add 9 cups of cold water, pop the lid on and leave until tomorrow. 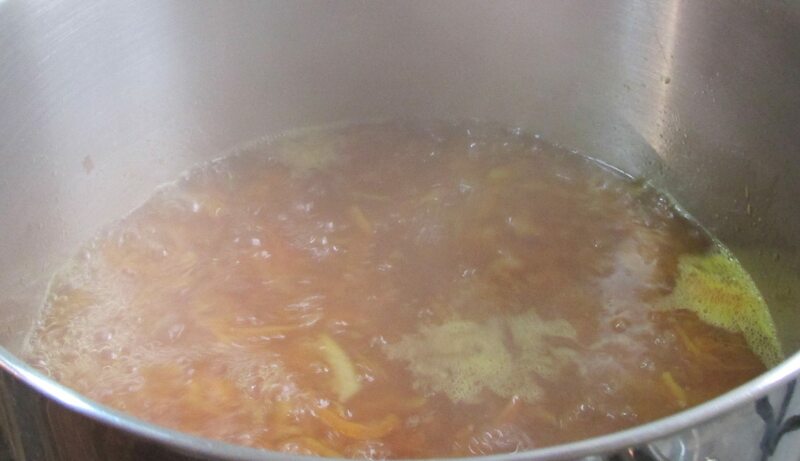 Next morning bring to a boil, and then turn down and simmer for one hour until the citrus is tender. Then add 9 cups of sugar. 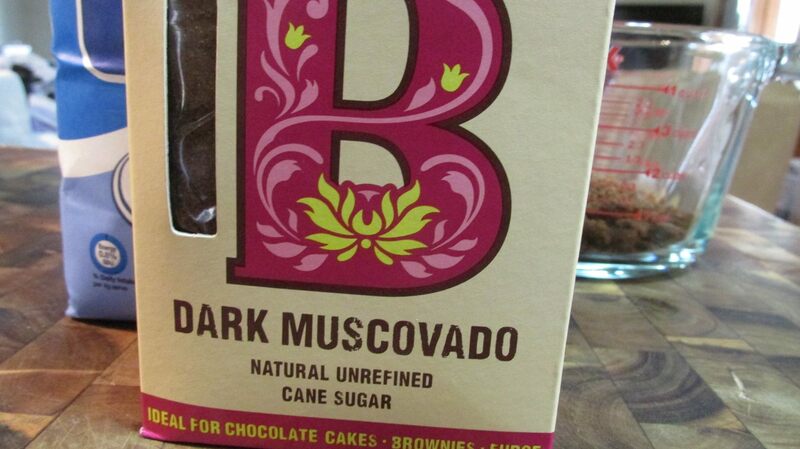 I decided to substitute about 85g of white sugar for Muscovado to give it a dark rich colour. This is optional. Stir to dissolve the sugar and then bring back up to a hard boil. Sterilise your jars. 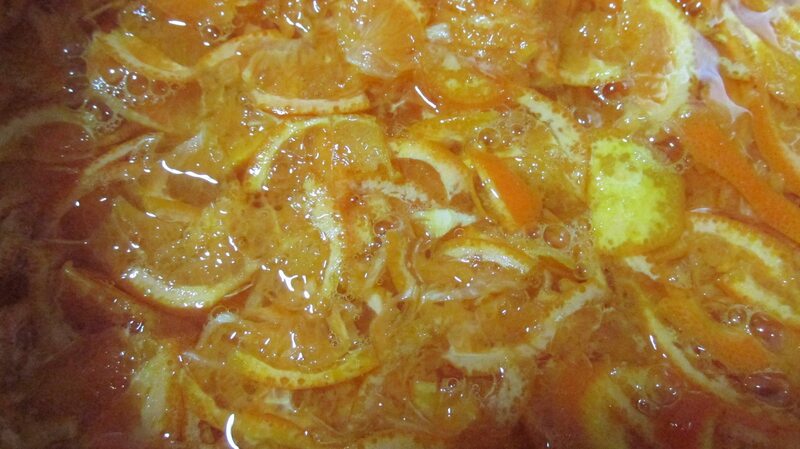 I wash in hot soapy water, rinse in hot water and the place upside down in the oven on the lowest setting (appox 115/120 Celsius) until dry, or you’re ready to fill with marmalade. Make sure you have a good cloth to take the jar from the oven and don’t place on the cold sink, put on a wooden bench/board or place a tea towel on the bench, the hot on cold may crack your jars. Sterilise lids and other equipment. 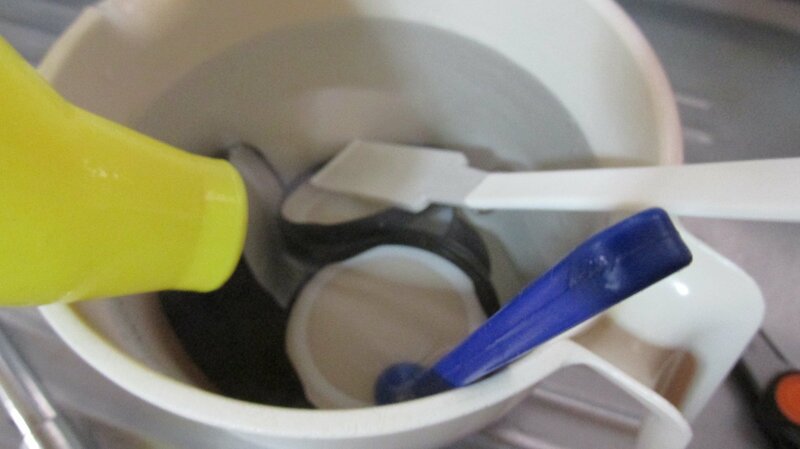 Here’s my lids, stick thing (white) if needed to poke in the marmalade to remove bubbles, lid ‘picker upper’ (blue) it’s got a magnet and you can pick up the lids in boiling water without touching the inside of the lid. 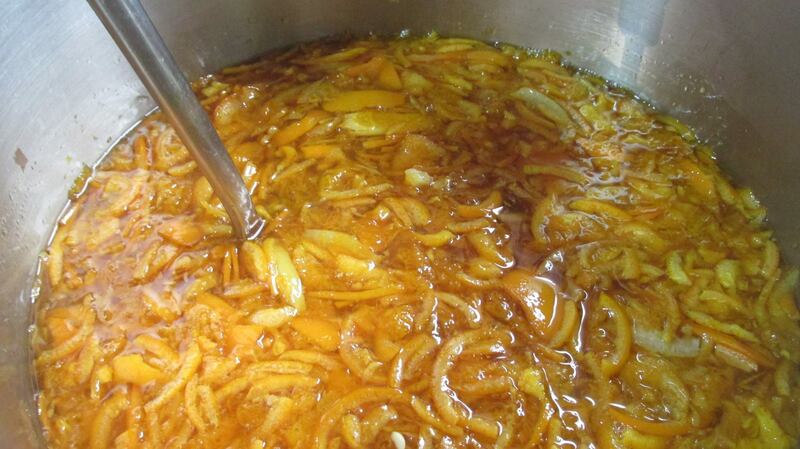 And a funnel, make sure the funnel fits into the jar and is wide enough for the marmalade to fall through easily. 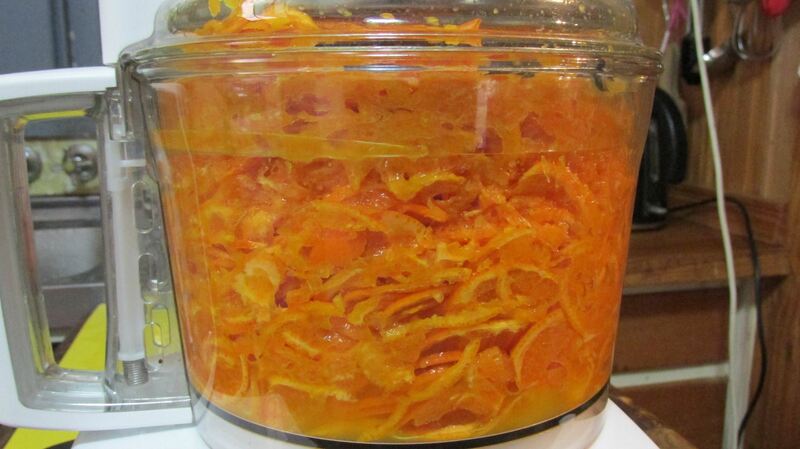 To test setting point, place a small plate into the freezer, when you think the marmalade is set take it off the stove and take the plate from the freezer, place a small amount on the plate and return to the freezer for one minute. 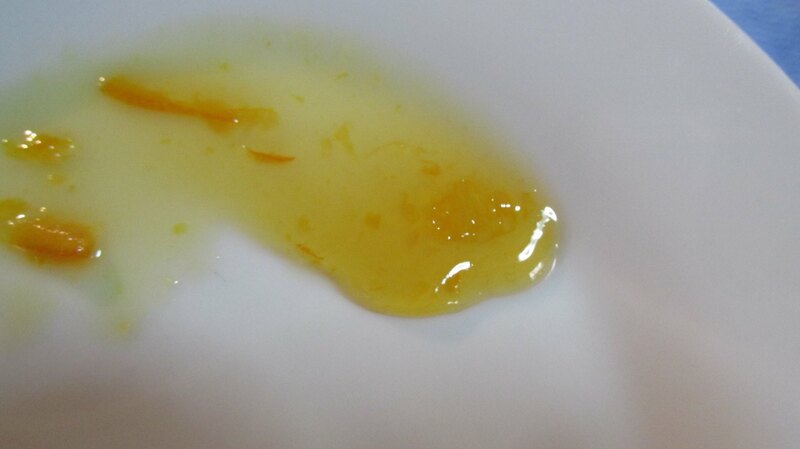 The marmalade shouldn’t run easily down the plate and should crinkle a bit when pushed with your finger. Now I will say here I’m a terrible judge so I get uneven results with differing batches, but with more experience that should be better. Once the setting point is reached remove from the stove and ladle into jars. I use a new Chux dampened with very hot water to rub the rims of the jars to ensure there is no jam on the rim as this can affect the seal. 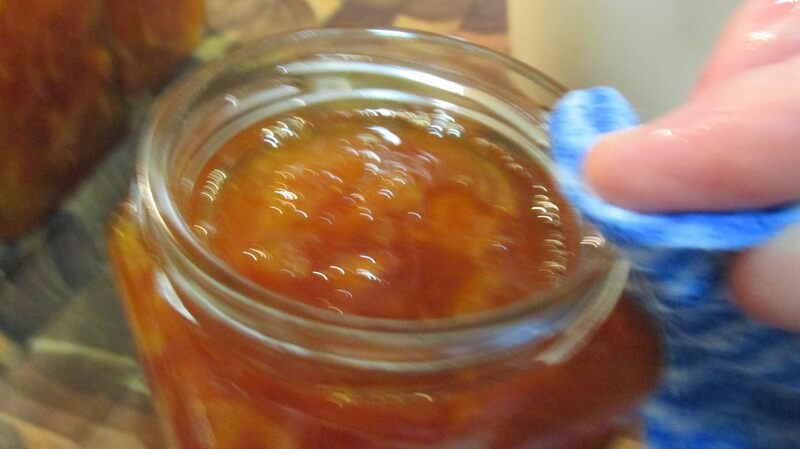 DO NOT allow the Chux or your finger into the marmalade. All bottled and now to wait and hear the popping of them sealing, always a wonderful sound when you bottle. I leave to cool and the next day when cold, I wash the bottles in hot soapy water and dry with a tea towel. 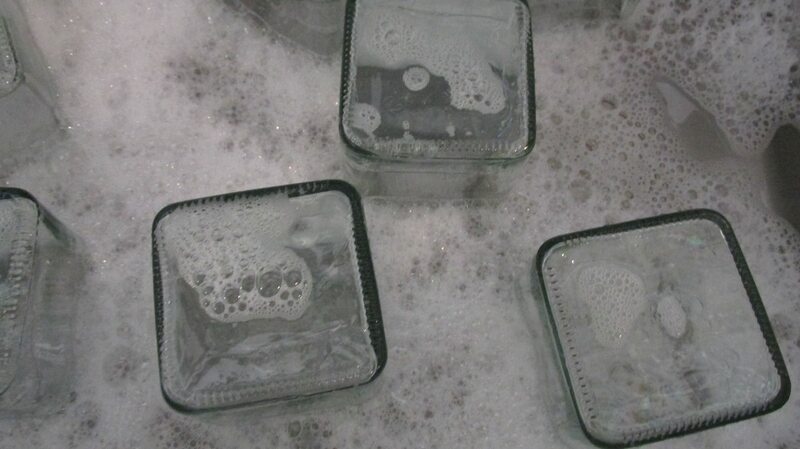 I don’t immerse in water just hold and wash thoroughly to remove any sticky on the jar. 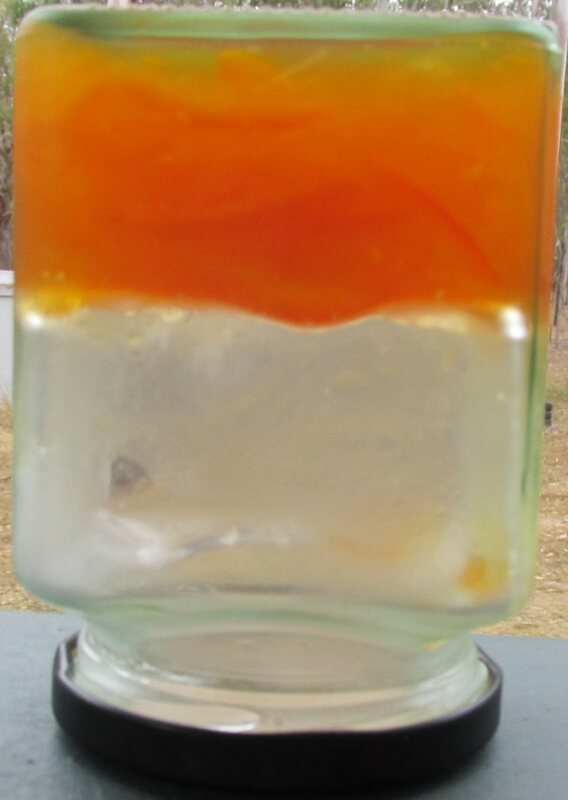 There’s nothing worse than a sticky jar, it attracts ants and other insects and if you’re selling your jam, as soon as someone feels something sticky they think something is wrong. Usually there’s a bit over which I put in a spare jar and put in the fridge when cooled. Next morning my test is to turn the jar upside down and try it on toast (the big test). This was from my previous batch and is what I aim for, this batch was a little more runny but still tasted great and was good on toast. I don’t mind it a bit soft, because I like to use marmalade for cakes (put some in the bottom of a lined tin, pour on batter and cook, and you have an upside down marmalade cake) or over chicken when cooking or over chicken or pork as a sauce. Bits and bobs about life as the new President of the Country Women's Association of NSW.